Since having our 4th child last year, I feel behind. Things are fine, but that is just the thing. I feel like when it comes to the house and laundry, things are just fine, I am just getting by. I can't seem to get ahead. It used to be that I got ahead, and then found a way to do more. Reorganize toys, clean out cabinets, organize too small clothes by size and season. Not right now. I look around and there is soooo much that I need to do, I don't know where to start. I don't feel on top of the regular laundry, let alone extra time to reorganize or get ahead. Feeling behind is stressful. I have been trying to come up with a plan to tackle the "behind-ness" and I keep going back to a conversation I had with my grandmother a few years ago. After we had our second child I was talking to my grandma. We were standing on her driveway talking about the changes that come with two kids. As we stood there that day she looked at me and said..."Heather, don't forget to KISS." I was confused, KISS, what was she talking about. I laughed as she looked at me and repeated, "Heather, Keep It Simple Stupid!" I have a smart grandma. Funny too! 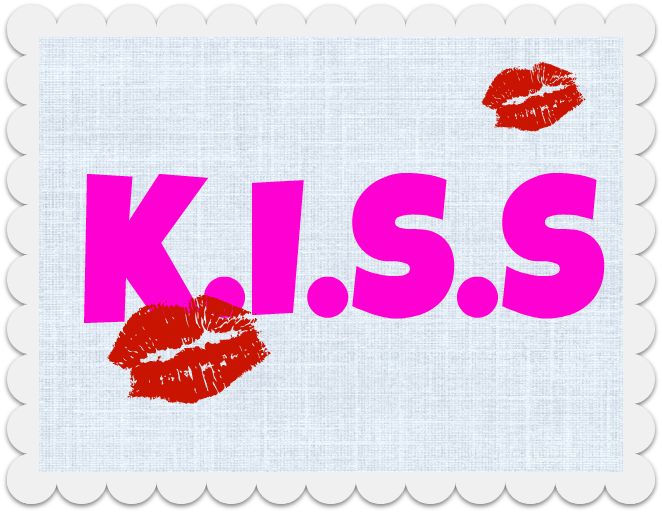 KISS has become my new mantra. Over the last 11 years of marriage and kids, we have collected things and stuff. It was all important at some point in time, but not now. There are things I have held on to, that I am ready to let go of. Slowly but surely as our family has grown and gotten busier, there is more than I can manage. KISS applies to every aspect of our lives. We need to keep our stuff simple, or schedules simple, our relationships simple. We need to avoid surrounding ourselves with more than we can manage, taking on more than we can handle, or trying to run faster than we have energy. Otherwise, we miss out on our families, because we are so stressed managing all the "stuff". Time to get back to basics, and keep it simple. I have been stupid long enough. Anyone else need to remember to K.I.S.S? Oh yes! Yesterday my bed was covered in clean laundry, library books were piled all over, the house felt like a wreck and yet we still headed off to the pool. It is what it is right now. Not till just now did I recall a good corollary to KISS which a former principal told me: This is what finished looks like for today. We just moved and moved our entire storage unit as well. All this stuff that we haven't needed or used in over 18 months! I just want to throw it all away rather than find a place for it. There are lots more ways to keep it simple, but getting rid of my stuff is my first step. This needs to be my mantra too! Two kids and a service blog and I feel like I can't get a head. I love home dec stuff and when I see stuff now it's like, I love that but I don't need more stuff, I got enough stuff. I try and keep it simple but must not be very good at it. Great post, thanks for the reminder! I would love to know of any time management tricks you have or tools you use. Love your site! I just found you from the LDS tech video on You tube. We are in the process of moving from Houston back to BYu so my husband can go to the MBA program. Read: DOWNSIZING OUR HOME! It has felt so nice to get rid of everything that we really do not need. Less toys, clothes etc=more time to spend as a family laughing and outside and having fun. I came across your blog in a moment of deep mommy discouragement. Thanks for lifting my spirits. The mommy club is hard most days, but some days are even harder than others. I find that cleaning things out and getting rid of things to simplify really liberates me. I feel so good about getting rid of things we don't need. Especially if I can give it to someone else who could use it. I just saw you on tv and looked your blog right up! I need to KISS too but I don't know how! Sounds strange but I need to learn better how. I think the hardest part is knowing when to say no. I'm excited to read more of your blog! Thanks! Just saw you on Studio 5! Great job! You are famous!